If you are taking your own car to Norway, you will need to register for the toll road network in advance. See http://www.autopass.no/en/visitors-payment for further details. This tour is very feasible in one day, but perhaps even better in two. Any day is fine, but note that on Sundays, the Norwegian History Centre opens its doors at the relatively late hour of 12:00 p.m. On other days it is earlier, 10:00 a.m. on weekdays and 11:00 a.m. on Saturdays. It’s better in the summertime. The Norwegian History Centre is fully open from late April to late September only, and during the off-season it is open only on Wednesdays and Sundays. The Viking Farm is open during the summer months only. 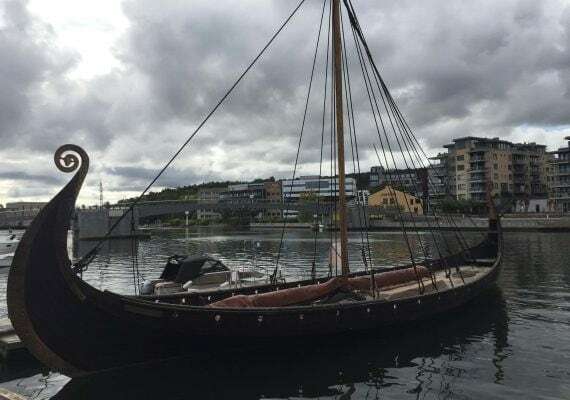 A combined ticket for The Norwegian History Centre and Viking Farm is available, saving a little on buying the tickets individually. This cost us 150NOK (€16 or $20) for adults and 50NOK (€5 or $6) for children (Summer 2017 prices). Taking a family vacation to Norway? 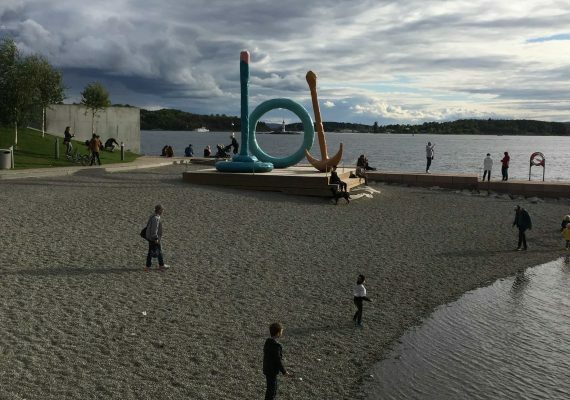 Experience Viking history, a delightful wooden fishing town and some of the best beaches you'll ever see in this Norway with kids itinerary. Head to Karmøy, Norway for a day of fun, learning and adventure. All on one Norwegian island that you have probably never heard of before. First, visit the Norwegian History Centre to learn all about the birthplace of Norway. Then, take the kids to a Viking Farm for continued adventure. Next, drive to the quaint, old wooden fishing village of Skudeneshavn. Lastly, brave the frigid but beautiful waters of Norway's beaches at Ferkingstad and Åkrasanden. 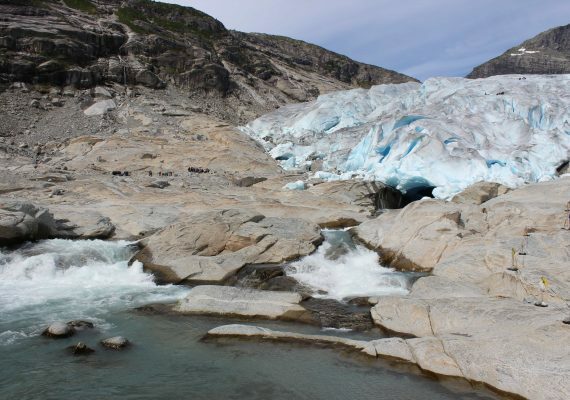 Set your own pace and enjoy this family-oriented itinerary on your Norwegian vacation. The first kings of the newly unified nation of Norway ruled from this hill overlooking a popular shipping channel known for centuries as the being the safe route north: the "Northern Way", or, more simply "Norway". The Norwegian History Centre is an atmospheric and high-tech exhibition on the birth of Norway, with plenty to keep the kids entertained. For an additional 50NOK (about €5.50 or $7 at time of writing), kids can receive a bumper activity pack allowing them to be either a "Viking for the day" or an "Archaeologist for the day". However, this is really an all-day activity and requires effort and concentration. Even without purchasing the activity pack, kids can dress up as Vikings and partake in some hands-on Viking-related activities. Most written descriptions in the exhibition are in Norwegian only. However, an English audio guide is available free of charge. We spent around two hours in there, including a waffle break in the kid-friendly café. DIRECTIONS The island of Karmøy is located in southwest Norway. It is recommended to do this tour by car. If arriving from the north, there is a road bridge (Route 47) between Karmøy and mainland Norway (just south of Haugesund and road tolls apply: 25NOK each way). If arriving from the south, a spectacular tunnel connects Karmøy to the main E39 highway between Stavanger and Bergen. TIP Free tea and coffee refills in the restaurant. There’s a shop with above-average range of original Norwegian souvenirs. The Viking Farm is a reconstruction of a typical 10th-century Viking settlement. It boasts an impressive and atmospheric "long house," surrounded by several minor buildings, gardens and wandering livestock. There are many activities available for children, including traditional arts, crafts and board games. Plus, free guided (albeit infrequent) tours available in English. DIRECTIONS This is located on the island of Bukkøy, a 10-minute walk from the Norwegian History Centre. The route is possible for strollers and wheelchairs, but the path is uneven. TIP A combined ticket with Norwegian History Centre is available. Credit cards are not accepted. Picnic tables and barbecue pits are available near the shoreline just outside the Viking Farm. Skudeneshavn is a mini-Bergen, without the coach and cruise tourists, but prettier. The old town of Skudeneshavn is a wonderfully preserved collection of over 100 white wooden houses and warehouses from the 1800s. Most of the buildings were initially built in the era when Skudeneshavn grew wealthy by virtue of its prominent role in the herring industry. A stroll around the town today gives an incredibly picturesque and evocative impression of life in this part of Norway some 200 years ago, whilst being completely in tune with modern-day life. We adored it, and think that other families will, too. DIRECTIONS From the Norwegian History Centre, drive south on Route 47. At Kopervik, you can either continue on the 47 or take the quieter 511; the latter option may take slightly longer, but is more scenic and does not incur as many tolls. Driving time from History Centre is around 35 minutes and there is ample free parking available in the town centre near the Tourist Information Centre. TIP Pick up a free leaflet on the "heritage trail" from the local tourist office. Since Norway is expensive for dining out, especially with kids, pack a picnic (or make your own from the Co-op supermarket on Selvåg) and munch it at one of the numerous picnic tables on the town square (Torget). There’s a small, but nice playground on Havnafjellet (directly on the "heritage trail"). Now it’s time to check out some of Norway’s beaches. 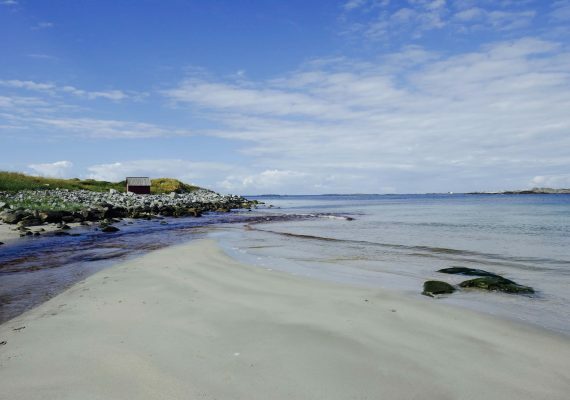 These are two delightful, family-friendly beaches on the west coast of Karmøy. They both have a greenish-blue sea gently caressing the finest white sand imaginable. Shallow waters make the sea perfectly suitable for bathing, but, be warned: it is cold! Ferkingstad Beach is (marginally) less pretty than Åkrasanden, but is more sheltered and will be quieter. Our kids particularly enjoyed snorkelling in the clear water, flying a kite and collecting strange stones and seaweed. DIRECTIONS From Skudeneshavn, follow Route 47 northwards (direction Åkra / Kopervik) For Åkrasanden beaches, look out for signposts just before entering the town of Åkra. Ferkingstad Beach is a few kilometres further south, on "Stavavegen". The driving time from Skudeneshavn is about 15 minutes. TIP If you have wetsuits for your children, bring them, the water may look tropical but it is not. Toilet facilities are available at Åkrasanden, but not in Ferkingstad Beach.